$15 advance tickets — SKIP THE LINE! 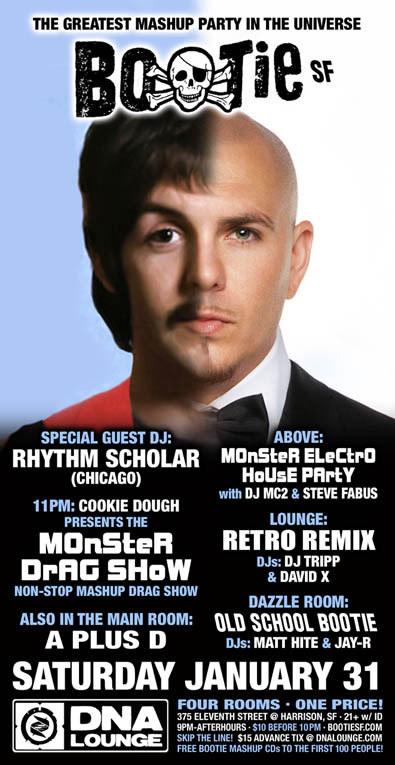 Bootie is proud to present special guest DJ Rhythm Scholar, direct from Chicago. His unique mashup and remix sets are infused with his signature brand of funk and disco, sure to keep you on the dance floor! Joining him in the Main Room will be resident DJs A Plus D, as they keep the floor bumping with the best mashups in the universe! At 11 PM, Cookie Dough and her carnival of drag queens presents another insanely wonderful Monster Drag Show, filling the stage with some of the most creative drag in the Bay Area! Upstairs in Above, the Monster Drag Show’s DJ MC2 and Go Bang’s Steve Fabus take over with the Monster-Electro House Party, sure to keep your feet moving. In the Lounge, it’s Retro Remix, as DJ Tripp and David X give classic songs a modern makeover. And finally, in the Dazzle Room, it’s Old School Bootie, as Bootie DJs Matt Hite and Jay-R bring back the sound of Bootie’s early Cherry Bar days, playing all the great mashups from “back in the day!” All this, plus club photographer ShutterSlut there to document the madness, and FREE Bootie CDs to the first 100 people through the door!